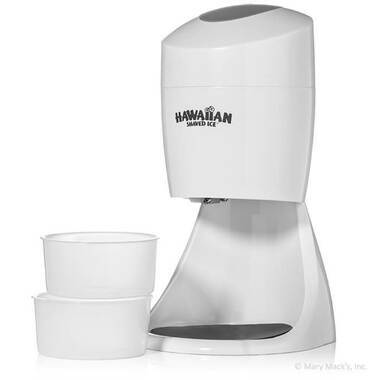 Create the perfect summertime (or anytime) treat with a Hawaiian Shaved Ice S900A electric home ice shaver. 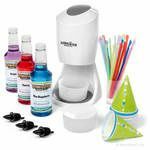 This simple-to-use machine can handle the heavy-duty loads that sleepovers, pool parties, and other get-togethers demand, and it's easy to clean. That means it's perfect for frequent entertainers or shaved ice enthusiasts who enjoy the crisp, delicious taste of fluffy, flavored snow. The S900 electric shaved ice machine is just 6.5 inches wide, 8 inches in diameter and 14 inches tall, so it's easy to tuck neatly in the corner of almost any counter. 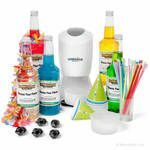 Don't forget to add some flavored snow cone syrups to your order! 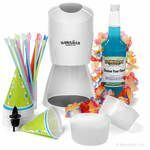 This machine is also available as a complete party package that feature syrups, cups, and straws. For differences between the S700 and S900A machines, see our comparison chart. 6 1/2" W x 8" D x 14" H.
Electric, 120 V, 55W, 60 Hz. The day is finally here. You've been waiting for this day. 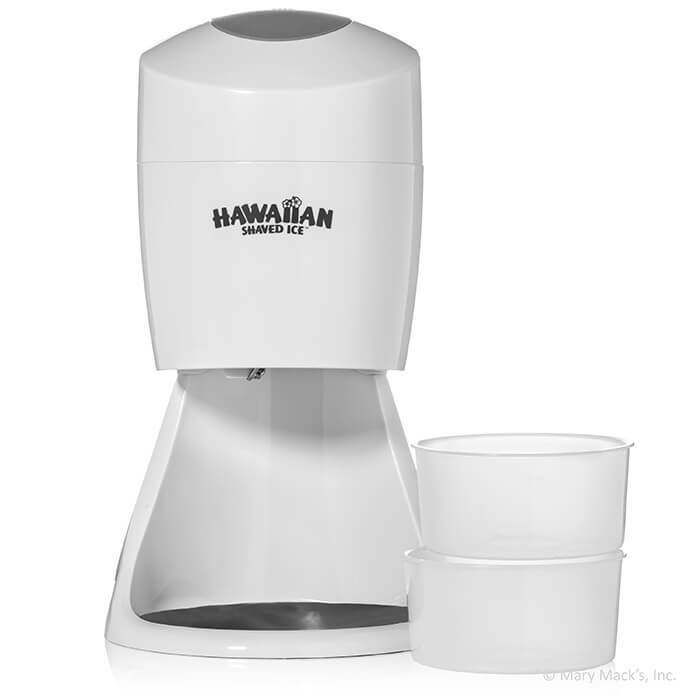 Your Electric Hawaiian Shaved Ice Maker is begging to shave its first batch of fluffy snow. Go ahead and remove the contents of your box. Inside your box, you will find the following items. Your first step to using your ice shaver, believe it or not, doesn't include the machine! Before you can shave ice, you need...ICE! Start off by filling your ice molds with water and then placing them on a level surface in the freezer until the water is completely frozen. Oftentimes, we tend to fill ours in the evening and let it freeze overnight. Standard household ice cubes (produced from most residential refrigerators) may be used instead of ice blocks, however, the shaved ice produced from ice cubes will not be as fluffy as shaved ice produced from ice blocks. For the best snow, we recommend using the two molds we included with your machine. We also sell additional ice molds if you need more. After you have ice, it's time to assemble and use your machine. Always ensure that the appliance is switched off and that it is not plugged into an electrical outlet before you assemble and dismantle the ice shaver. To begin, place the support base on your work surface. Insert the ice crusher cup into the support base ensuring that the ice crusher cup is completely inserted into the base. Position the non-slip mat on the support base and place a small bowl or ice cup (not supplied) on top of your mat. The small bowl or ice cup will be used to catch the ice as it is shaved. Remove the frozen ice molds out of the freezer and extract the frozen round ice block from the plastic ice mold. For the fluffiest snow, allow your ice block (or cubes) to thaw for about 5 minutes (the pros call this tempering). During the freezing stage, the block of ice may become dome-shaped. If this should happen, place the dome-shaped side of the ice block down into the machine. The flattest side of the ice block should be facing up. Now, it's time to start shaving. Place the motor unit on top of the ice. Plug the ice shaver into an electrical outlet. Gently press and hold the gray on/off button while applying pressure to the top of the motor unit. The motor unit will begin to shave the ice block or ice cubes. As you're shaving, you can choose to stop shaving halfway through the block or you can shave the entire block. One block of ice produces about 16 oz. of freshly shaved ice. To stop the motor unit from shaving, remove your hand from the on/off button. Unplug the ice shaver from the electrical outlet immediately after use. After shaving an ice block or ice cubes, a thin block of ice will remain inside the ice crusher cup. The remaining ice must be thrown away before a new ice block is inserted into the ice crusher cup. When removing the remaining ice block, use caution and pay special attention to the blade and avoid all contact with the blade to prevent injury to yourself or others. At this point, you can add your favorite Premium Hawaiian Shaved Ice Syrup and enjoy! Cleaning this machine is a cinch. Simply dismantle the appliance in the reverse order to the procedure described for assembling it. During cleaning, use caution and pay special attention to the ice shaver blade and avoid all contact with the blade to prevent injury to yourself or others. Avoid using abrasive detergents or cloths. The motor unit may be cleaned with a slightly damp cloth but do not soak or immerse the motor unit in water or other liquid. All the machine parts other than the motor unit may be washed in warm water with a mild soap and rinsed with water or washed in a top rack of a dishwasher at a temperature no higher than 150�F. Make sure you never wash the motor unit in the dishwasher. Dry all the parts paying particular attention to the blade before storing your appliance. Assuming you use your Hawaiian Shaved Ice Maker once a day, we suggest changing your blade every year. We carry spare shaved ice machine blades and changing your blade is simple. Always take a good look at your current blade before changing. To remove the blade, simply loosen the two screws and slide the blade up and away from yourself being careful not to slice your fingers. Once your blade is removed, take your new blade and carefully slide it in from the top of the ice crusher cup down the open blade area. Slide the notches in the blade under the washers and screw heads. Adjust your blade so the bottom aligns with the bottom of the angled blade support. For smoother ice, adjust your blade down and for a crunchier ice adjust your blade slightly higher. Finally, tighten your screws firmly making sure not to over tighten. Do I have to use the ice molds provided? Can I use regular ice cubes? Whew, glad you asked. 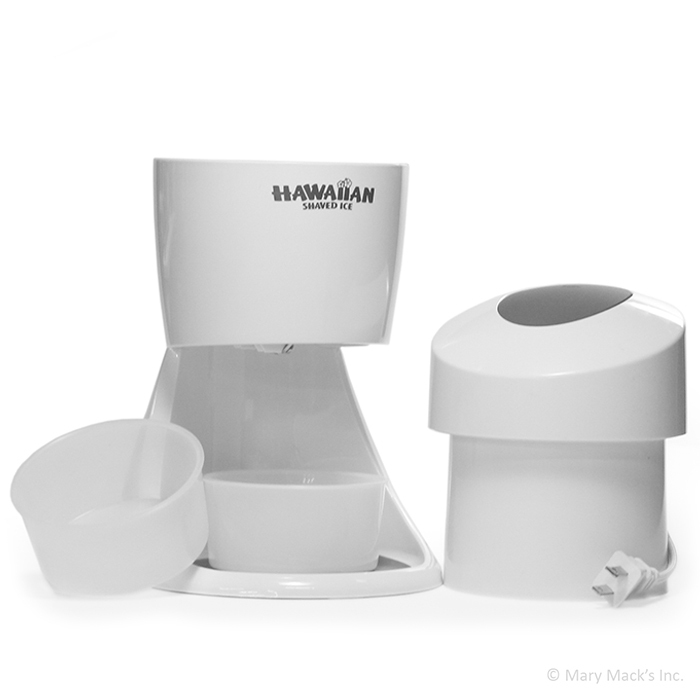 For the fluffiest shaved ice, you'll want to use the two ice molds provided with your machine. That's actually the unique advantage of the block ice machine, to give you the nice smooth snow you're looking for. But if you insist, standard household ice can be used; however, the end product is not as fluffy. Block ice machines are known for their softer snow and cube ice machines make a crunchier snow. If we were Mother Nature, we'd call it snow and sleet. If you want the crunch, check out the Snow Cone Machine (S700). Now that you've convinced me, can I use regular tap water in my ice molds? You sure can! Does your tap water have a not-so-pleasant taste? (It's OK, ours does too.) Just add any of our delicious snow cone syrups and you'll never taste it! Of course you can go to your local store and buy a gallon of water if you wish. I'm having a shindig at my house. How many should I invite? We suggest inviting everyone who loves Hawaiian Shaved Ice (including us). If you plan on serving 20 guests or less, this machine is perfect for you. Each ice mold shaves about 16 oz. of fresh fluffy snow, enough for two people. 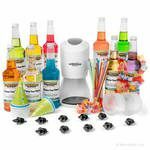 The ice shaver includes two molds and you can always purchase more ice molds or tell your friends to BYOB. Bring Your Own Block (of ice). I don't have much counter space; will this fit in my kitchen cabinet? Is it easy to clean after I use it? Certainly! This machine breaks down easily for cleaning and storage. As for cleaning, we must tell you the parts are not dishwasher safe! However, since you're only using ice, you can easily dab it with a dry cloth. Cleanup on this machine is a piece-of-cake! How loud is this machine? When you forget to invite us to your shindig, we won't hear it. It's comparable to the average blender noise. My Great-Great-Great-Great Grandchildren want this machine, is this safe enough for them to use? How old are you? Since the machine has a blade, we do suggest adult supervision. This machine does have safety features to prevent injuries. If you question whether or not you should help the children, you probably should. What if my machine is a dud? Does it come with a warranty? Our Hawaiian Shaved Ice machines are carefully inspected before they enter your home. We apologize if you receive one with a defect, but your machine does come with a 1-year warranty. Our goal is to have 100% customer satisfaction. Does the blade ever get dull? Can I adjust it? Our high-quality stainless steel blades are similar to your kitchen knives, they do get dull. We suggest changing your blade every year. We sell replacement blades and other machine parts if you ever need them. With your screwdriver, replacing and adjusting the blade is simple. Making adjustments to the blade can give you crunchier or smoother snow, depending on your preference. The smoother snow may take you a few more seconds to shave. Wait�don't leave me. I've got more questions! Sorry Charlie, my shaved ice is melting quickly. Feel free to call us anytime at 1-800-742-8334 and we promise these southern-speaking folks can help you with any questions you have.